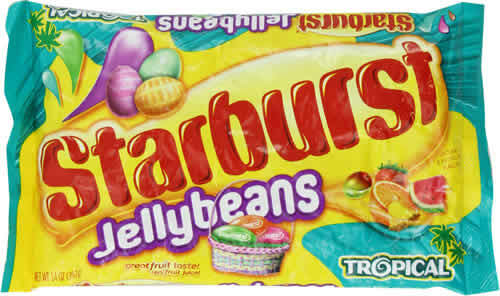 For the third time this season, we revisit another popular series: Starburst Jelly Beans! This is the fifth variety from Starburst that I have reviewed, and they consistently rate highly, so I was definitely looking forward to getting into this bag. It also marks the third tropical flavor set I’ve reviewed, following the strong entries by Teenee Beanee and Brach’s (the first Brach’s product I enjoyed!). Again, like Jelly Belly and Teenee Beanee, the physical characteristics of these Starburst beans are very similar to most of the Starburst beans I’ve previously reviewed. It’s been a while, though, so let’s go through them again. In a strange turn of events (or evolution of my sensibilities), having previously knocked Starburst beans for being a bit undersized, I find the size of the beans in this bag a hair above where I want it to be. I wonder if Starburst has changed anything about their process, or if the process varies somewhat between their different varieties. A few are on the small side, though, and a few are significantly too large. Some also have a point sticking out of one end, like it set up too quickly before the material could coalesce into a rounded shape. Aside from those outliers, roundness is good and there are few flat parts or edges, but no attempt is made to have a bean dimple. The prevailing shape is that of an egg. Starburst Jelly Beans continue their perfect track record for chewability. The shell takes an appropriate amount of effort to get through on initial bite, and once you’re on the other side, the insides aren’t too firm. Despite not being hard to chew, they take long enough to chew that you extract plenty of flavor out of just a single bean. Texture is another very good category for Starburst. Continuing the comparison to an egg, these beans have a real shell that cracks like an eggshell around a hardboiled egg. This might be the pinnacle of shell texture so far. The one knock on the texture is that the insides could be a little smoother. They’re somewhat grainy, but not enough to be a major turn-off. This bag differs significantly from the first two tropical collections I reviewed in that you don’t get an overpowering sense of tropical scents when opening it. Tropical flavors can often seem somewhat muted in candy form, but Starburst takes a bigger, bolder approach to tropical flavor than its competitors. The flavors feel more like eating a ripe piece of tropical fruit a few miles from where it was grown than eating one shipped hundreds or thousands of miles to whatever probably-non-tropical locale in which you live. Tropical Punch is the standout flavor in this bag. It’s a dead ringer for Hawaiian Punch, which I quite enjoyed as a kid. Strawberry Banana is also excellent, with its clearly-defined strawberry and banana flavors. Kiwi Strawberry and Watermelon land in the middle of the pack, both solid but unremarkable flavors. Pineapple Orange could use some more acidity, but it’s not bad. Mango Melon is my least favorite, but it does avoid the trap of having a muted, artificial mango flavor, and actually tastes like ripe mango. The quibbles given above are very minor, in the grand scheme of things. This is a delicious collection of strong flavors. One of the best all-around groupings I’ve had in a while. Six slightly-oversized beans is a mouthful, and like other Starburst beans, these suffer from the Skittles effect, but these flavors work together very well. The flavors remain bright and punchy, and you can pick out each flavor as you chew. I tend to prefer eating these beans in pairs, but it’s a solid one-of-each performance. Another strong performance from Starburst! Happy to have a few more Starburst varieties in the queue down the road. Come back next week as we dip our toes into the scary waters of Brach’s again!